Even before we started our renovation some four years ago – we decided on a place where we would collect all our organic “garbage”. Partly because we both grew up with the knowledge that anything that decomposes should not end up in a landfill and partly because we realized that we needed tons of good humus to turn our property into a productive and thriving land! Decades, even centuries of exploiting this incredibly giving and forgiving land had turned it into depleted, cracking and concrete-like soil! We planted hundreds of tress, shrubs and other plants to help shade the soil and ultimately help us use less and less water. 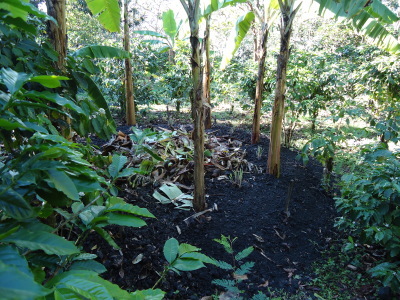 Most of our ground is covered with leaves and grass cuttings or coffee prunings, that were chopped and dropped right at the plant; all of this decomposes and helps build our soil. Wooden beams that were removed during the renovation and not put to use again in the house have been strategically placed on steep hillsides to catch falling leaves and other matter. Now, after this short time we see huge improvements in soil quality and a decrease in water consumption. 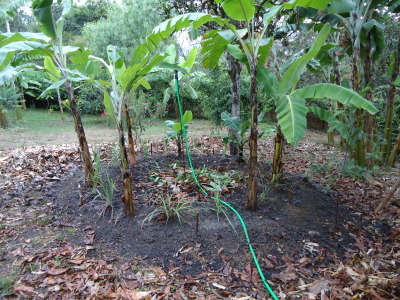 Permaculture in this climate is so much fun! 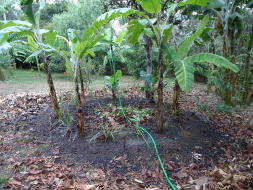 Our first banana circle was put into place about 2 months ago and another one was created just last week! The decomposition of a compost pile takes about 8 months before you can “harvest” humus – in our countries (US/State of Washington and Switzerland) it takes about 2 years! 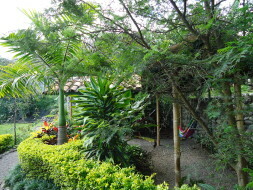 Permaculture is one of those rare occasions where nature was aided by human beings to maximize the synergies that are created when certain plants and systems are combined. 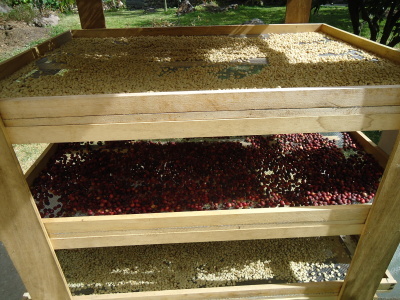 We look back at a very challenging but very successful coffee harvest. 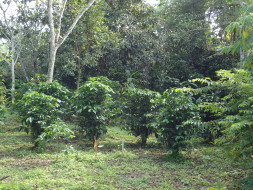 Changing climatic conditions extended this year’s harvest into August. In a regular year we usually dry the last of the beans in May…The Santuario Hibiscus coffee – our very own, organically, shade grown blend is more popular than ever and our guests love to start their days with a cup of that freshly brewed beverage! What started approximately 1000 years ago in Central America has long since become synonymous with relaxation, summer and easy, simple living – the hammock! 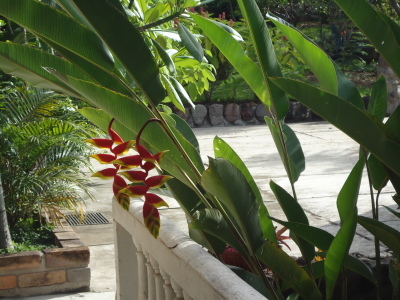 Surrounded by tropical plants – that are still small at this point – but will make this area very attractive. 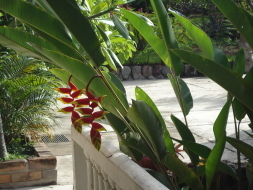 There are different kind of palms, flowering bananas, haliconias, torch ginger and many more. A very popular addition to our property! This entry was posted on Thursday, October 23rd, 2014 at 7:06 pm	and is filed under Uncategorized. You can follow any responses to this entry through the RSS 2.0 feed. You can leave a response, or trackback from your own site.